DENMARK: Siemens has displayed its first roll-on roll-off (Ro-Ro) vessel at a ceremony in Esbjerg, Denmark, the first of two similar vessels to be used by the manufacturer. The Rotra Vente vessel removes the need for a crane, but still has the facility for crane loading in ports unable to support Ro-Ro transfer. 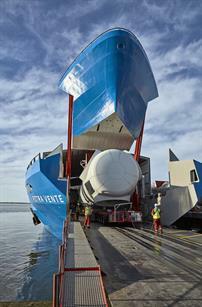 The second is expected to be delivered in 2017. 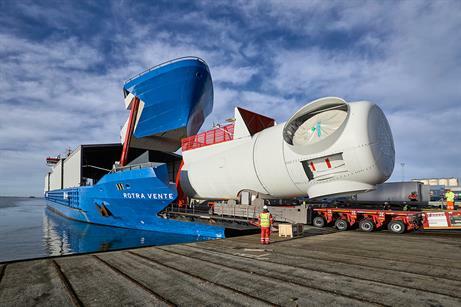 "The 141-metre vessel can carry multiple 8MW nacelles per trip... [It] can also handle transports of up to nine wind tower sections per trip, or three to four rotor blade sets," Siemens said. In November 2015, at the EWEA (now WindEurope) 2015 conference, Siemens announced it has signed a deal with Danish freight firm Deugro Danmark to supply two transport vessels. 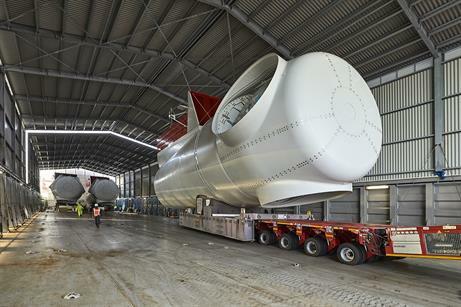 Siemens offshore wind CEO Michael Hannibal said the use of Ro-Ro could reduce transport costs by 20% compared to traditional methods. "When our new factories in Hull, England and Cuxhaven, Germany become fully operational, and both Ro-Ro vessels are in service, we expect savings of 15-20% in logistics costs compared to current transport procedures," Hannibal said.